This section is focused on use of GIS and related geographic-demographic-economic data to examine neighborhood patterns. You can use resources described here to flexibly examine neighborhood patterns for your areas of interest. The GIS resources reviewed in this section are provided as a part of the ProximityOne User Group. Join now. Select a state in the scroll section below to view/analyze patterns in that state. 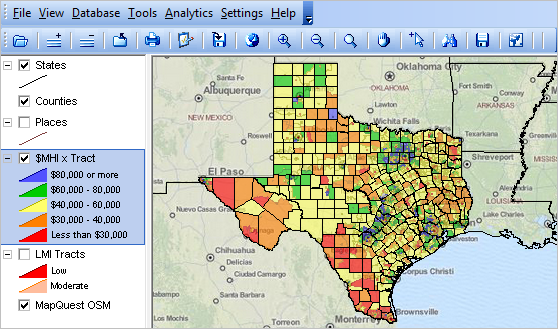 The graphic presented below (click for larger view) shows a thematic pattern map of Texas census tracts by median household income. This graphic shows the "start-up" view of the GIS project described in this section. We will review how, in just a few steps, you can develop maps like this one for interactive use; perform geographic drill-down and navigation; label tracts and other geography; change attributes of patterns and/or variables used in thematic maps; add other layers; and examine the data in tabular form. Click a state link to install and start using that state by neighborhood patterns GIS project. Resources made available via this Web page are proprietary to ProximityOne. The resources may be used in any manner without further authorization except that none of the resources may be redistributed and none of the resources may be used with other software. Links to this page are encouraged as well as use of the data in stories and analyses. Any use of these resources is solely at the discretion of the user. There is no warranty or guarantee of any type.